After a lull in my options activity as I adjusted back to being at work I've found a better system to be able to try and keep the momentum going. My preference is always to make my moves during market hours so I can try and get the best pricing, but since I'm working nights and sleeping during the day it's been much more difficult. Last week I discussed a new strategy for the cash that's lying around in my taxable brokerage account. I'm not exactly thrilled with the value propositions and wanted to see if I could be a bit more aggressive with options in the hope of generating more income over time than just investing the capital right now. For a few months' long experiment I figured it was worth a shot. I currently have an open jade lizard on GDX and wanted to "double down" at a lower cost basis. If GDX's share price falls below the strike price then I'll have to purchase 100 shares at $23.50 less the premium received. My effective purchase price would be $22.98 per share. That price be at a 6.7% discount to the price at the time the position was opened. 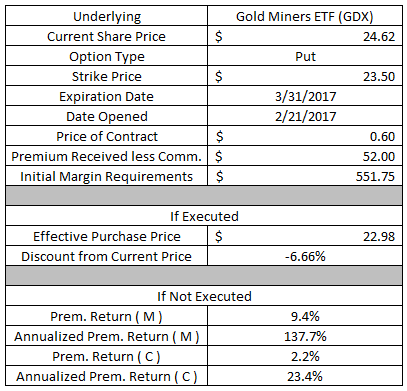 If GDX's share price remains above the $23.50 strike price then I'll get to keep the full option premium as profit. Since this was done in my taxable margin account the capital requirements are much less than a cash secured put. The initial margin requirements on this contract were $551.75. Based on the margin requirements the premium would represent a 9.4% return or 137.7% annualized. 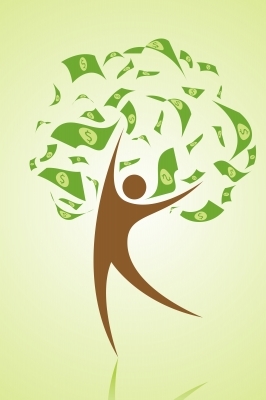 On a cash secured basis the premium would represent a 2.2% return or 23.4% annualized. This is the first time I've gone after Exxon as a potential options play and I'm liking what I see. Exxon's share price hasn't participated in the "Trump Bump" seeing it's share price decline from over $92 in mid-December to the low $80's of today. If Exxon's share price falls below $80.50 then I'll have to purchase 100 shares at that price. However, since I received the $69.95 of option premium my effective purchase price would be $79.80. 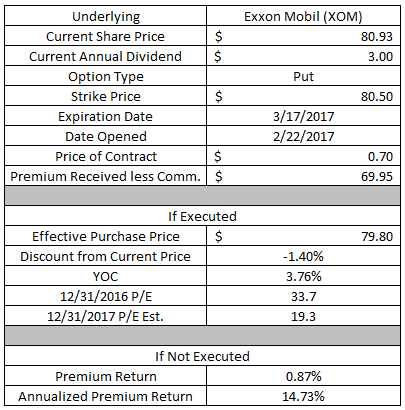 To me that's a pretty good valuation for Exxon with a YOC based on the current payout of 3.76%. 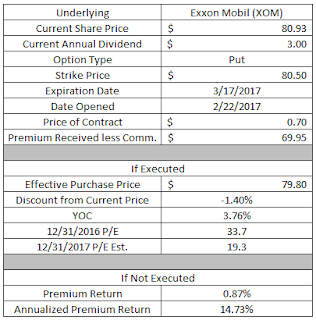 If Exxon's share price remains above $80.50 then I'll get to keep the full option premium as profit. The $69.95 in premium would represent a 0.87% return or 14.7% annualized. Lowe's is a company that I've frequently used to generate option income. It kept hanging around on the high end of my fair value range which made it ripe for the picking as they say. I've already successfully opened and closed 4 different contracts on Lowe's generating a net profit over $300. So I could essentially purchase shares today for a $3.00 discount. I currently have an open contract on Lowe's, but barring a catastrophic earnings report this week that shouldn't be at risk so I doubled down by opening another position. If Lowe's share price falls below the strike price of the put I'll have to purchase 100 shares at $74. The option premium of $74.95 would reduce my per share cost basis to an effective purchase price of $73.25. That's about a 4.6% discount to the price Lowe's was trading at at the time the contract was opened. The valuation there looks pretty compelling. The trailing P/E ratio, based on the estimates for the full year earnings do out this week, would be 18.7x. Looking ahead to the end of the current fiscal year, ending January 2018, the forward P/E would be 16.2x. The YOC at that purchase price would be 1.91%. 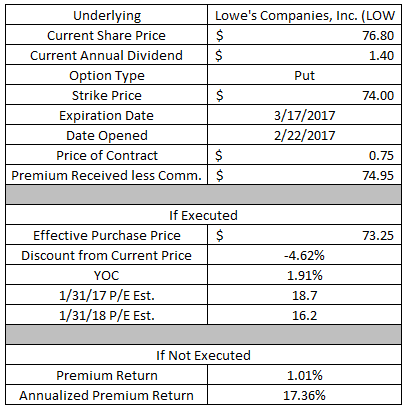 If Lowe's share price remains above the $74 strike I'll get to keep all of the option premium and go about my way. The $74.95 would represent a 1.01% return based on the $7,400 of capital necessary to secure the contract. On an annualized basis that's a 17.4% return. The covered strangle is quickly becoming one of my preferred plays on companies that I own. For those that don't know a covered strangle consists of owning shares of a company and simultaneously selling an OTM put and an OTM call option on the shares. The risk is that you could potentially have to own another 100 shares of the company if the put option is breached, but you know that going into it. By using a covered strangle as opposed to just a covered call you get to collect more option premium which improves the entire situation. You either lower your purchase price by more, increase your sale price by more or increase your return if the share price stays between the two strikes. As I alluded to earlier there's 3 ways a covered strangle can work out. If VF Corporation's share price falls below the $50 strike of the put option I'll have to buy 100 more shares of V.F. Corporation. 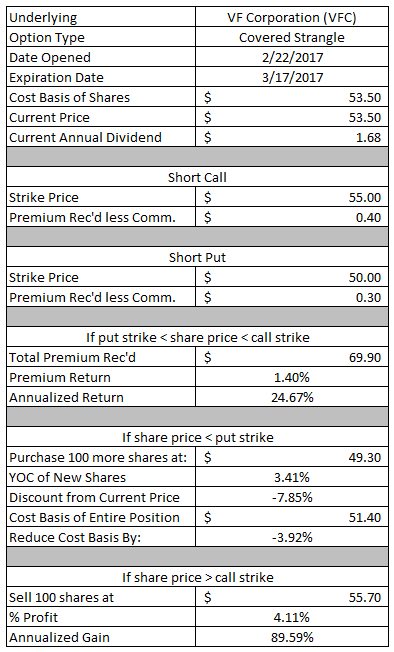 Since I received a total of $69.90 in option premium my effective purchase price on the new lot of shares would be $49.30 with a YOC of 3.41%. I currently own 100 shares of V.F. Corporation at $53.50 so my average cost basis for the entire position would be reduced to $51.40. If VF Corporation's share price rises above the $55 strike of the call option I'll have to sell my existing 100 shares. The sale price will be $55 plus the net premium received of $69.90 putting my sale price at $55.70. That would represent a 4.11% return based on the $53.50 cost basis or 89.6% annualized from the date the contract was opened until execution. Ideally VF Corporation's share price would just stay here between the 2 strike prices. That would mean both the put and call option would expire worthless and I'd just get to keep the entire option premium as profit. The $69.90 in option premium would represent a 1.40% return on the additional $5,000 in capital to cover the put option. The annualized return would be 24.7%. On February 17th I my put option on United Parcel Service ended in the money and I became the proud owner of 100 shares of Big Brown. With the current share price sitting well below my cost basis I've been searching for ways to lower my cost basis which led me to open a covered strangle position on my shares. If UPS' share price falls below the $105 strike of the put option I'll have to buy an additional 100 shares. The effective cost basis for the new lot of shares would be $103.49 which is about a 2.0% discount from the price UPS was trading for at the time the contract was opened. Since I currently own 100 shares of UPS at an average cost basis of $113.24 this will significantly reduce my cost basis for the entire position. Should the put option be executed my entire position in UPS would be 200 shares at an average cost basis of $108.37. If UPS' share price rises above the $114 strike of the call option I'll have to sell 100 shares of UPS. Since I received a total of $150.90 in option premium my effective sale price would be $115.51. That would represent a 2.0% gain on my existing shares and a 21.6% annualized return from the time the contract was opened through expiration. I don't mind doubling down on my UPS position, but my preference is to keep it at 100 shares. 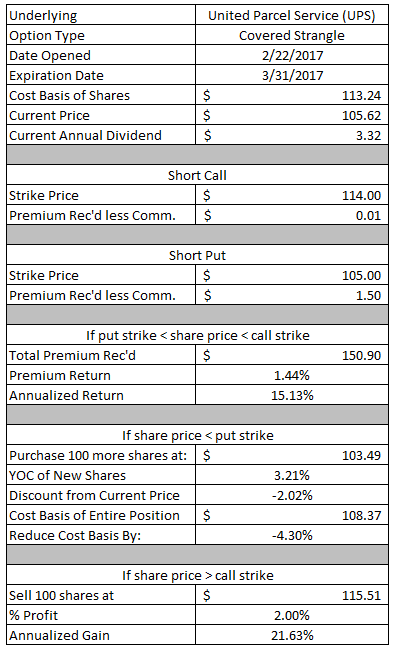 In order for that to happen UPS share price needs to stay between the $105 strike of the put option and the $114 strike of the call option and both of those contracts would expire out of the money. I would get to keep the full $150.90 of option premium which would be a 1.4% return based on the $10,500 of additional capital required to secure the put contract. On an annualized basis that would be a 15.1% return. If you take a closer look at the numbers this contract isn't exactly ideal. I'm still struggling with trying to find a good balance of putting on option plays since I have to do so pre-market. This one unfortunately bit me a bit because the $114 call option was essentially useless to tack on. UPS' share price had closed the prior day higher up around $106.50, but sold off on the open and moved against where I'd have liked to put the contract on. I'm still comfortable with this though because it will lower my overall cost basis if the put is executed and the recent dividend increase from UPS sure does help. I'll likely look to manage this one early if given the chance with a profit target of 50% of the premium collected. McCormick's share price was well out of harms way in terms of breaching the strike of this put option. However, with the flurry of activity on Wednesday I decided to take some "risk" off the table by closing out this position early. The net profit on this contract worked out to $59.91. Based on the $9,500 of capital "at risk" that's a 0.63% return. The annualized return works out to 33.2%. 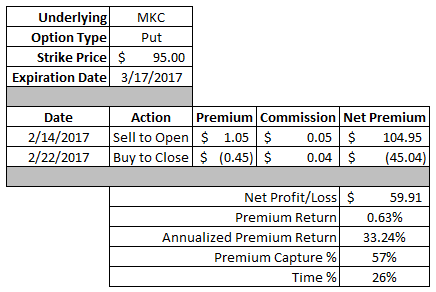 The timing was right in terms of needing to "de-risk" as well as McCormick's rise in share price and I was able to capture 57% of the profit potential in just 26% of the time to expiration. Starbucks' is one of my favorite picks in the consumer discretionary sector and I believe they have a solid chance at developing a multi-decade long dividend growth streak. Unfortunately the problem with Starbucks is that the valuation is rarely intriguing. When I analyzed the company last month I ended up with a low-$50's price target as a potential point to start acquiring shares, although sub-$50 would be much better. After announcing what was a relatively solid earnings report the share price of Starbucks sold off, but it didn't quite get to my buy zone area. However, it did allow me to sell a put option on Starbucks and the share price has since recovered. The net profit on this contract worked out to $67.95. Based on the $5,350 of capital to secure the position that's a solid 1.27% return. On an annualized basis that's a 23.31% return. I'd like to build up my position in PepsiCo because I like the diversification the company offers between snack foods as well as beverages. Ideally I'd like to add shares below $100, but I'd settle for adding some in the low $100's. I took advantage of some pre-earnings release rising implied volatility to set myself up to buy shares at an okay price or to generate a solid return. Post earnings though it's been nothing but higher share prices which was just fine by me since it allowed me to just let the put option expire OTM. This put option provided a net profit of $63.95 or a 0.61% return based on the $10,400 of capital necessary to hold the position. That's a solid 16.1% annualized return. Lately I've been trying to let my options go through to expiration in order to capture more of the original premium as well as to keep the velocity of money high. The quicker an option is closed the quicker that capital can be used to open a new position that can provide higher premium. Digital Realty's share price climbed after announcing earnings last week so I took advantage of the opportunity to close the contract early since it was tying up $10k. 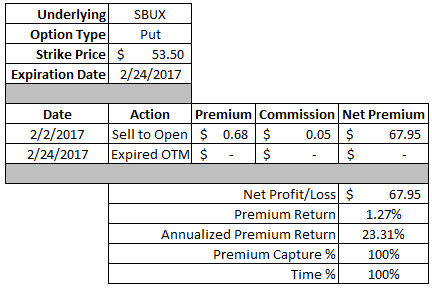 When I opened the contract I received $114.95 in option premium, but it cost me $45.04 to close it out. The net profit, after commissions, came to $69.91. Based on the $10k of capital required to secure the contract that's a 0.70% return. That might not sound all that great, but since it was earned in about 10 days that's a 29.0% annualized return. I was able to capture 61% of the maximum profit in just 32% of the days to expiration. The covered strangle is quickly becoming one of my preferred strategies for my Rollover IRA since I have ample cash available to invest. Since you simultaneously sell a call and put option you increase the amount of option premium you receive and if it stays between the two strikes you generate a higher return. The net profit on this covered strangle worked out to $67.82. Based on the additional $7,750 of capital at risk to secure the put side of the strangle that's a 0.88% return. Since this position was closed in about 1.5 weeks that pushes the annualized return up to 37.5%. I was able to capture 68% of the maximum profit in just 42% of the days to expiration. 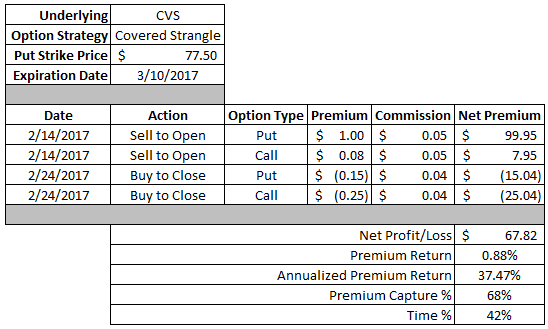 CVS's share price had rallied since I opened this position so I wanted to lock in these profits at a solid gain and look to for opportunities to reset my position likely at a higher strike call option. Hopefully today will give me a chance to do so. 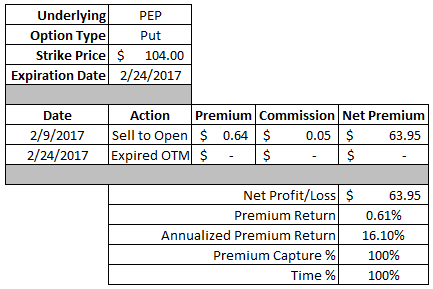 Thus far in February I've been able to generate $1,407.91 in profit via closed/expired options. Year to date I've collected $3,037.30 in option premium profit. I currently have 7 open put contracts in my Rollover IRA with total capital requirements of $46,500. If the markets cooperate then I'd like to get some more positions on early this week. I love to trade stocks. I found it a problem in the past to find the funds I needed to trade once I found a great chart set up. I have never traded options but I like the buzz about them, anyway I have found that passive income is one of the greatest ways I have found to generate income to trade with. I have even secret shopped for companies to generate income for trading. The most effective method that I have found on the internet is this one http://bit.ly/2leuooW . Never give up on your money making efforts because they may seem not to work at first but mistakes must be made to hit the target. I wish you all the best in your money making efforts and stay encouraged. Have a great day. Nice blog. I just read and signed up. Looking forward to your future thoughts and threads. 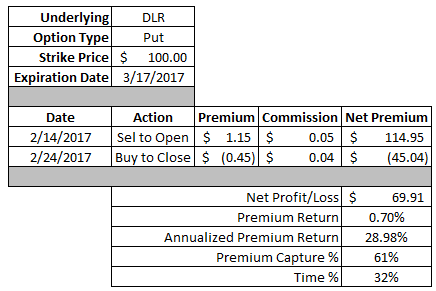 I have recently started writing cash covered puts and covered call after 5 yrs of semi-active stock buying. For the must part I am a buy and hold guy. Correction sold OOM NKE puts! !